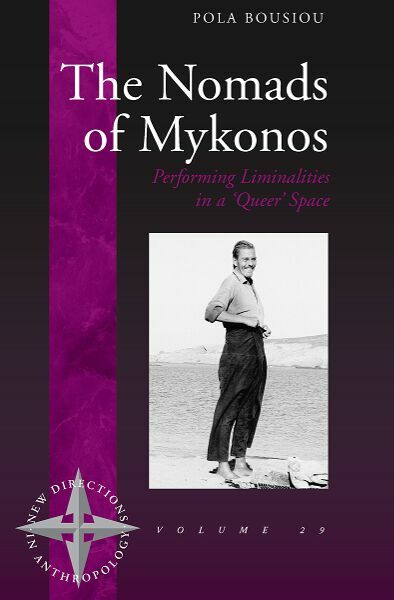 This is the ethnography of the Mykoniots d’élection, a ‘gang’ of romantic adventurers who have been visiting the island of Mykonos for the last thirty-five years and have formed a community of dispersed friends. Their constant return to and insistence on working, acting and creating in a tourist space, offers them an extreme identity, which in turn is aesthetically marked by the transient cultural properties of Mykonos. Drawing semiotically from its ancient counterpart Delos, whose myth of emergence entails a spatial restlessness, contemporary Mykonos also acquires an idiosyncratic fluidity. In mythology Delos, the island of Apollo, was condemned by the gods to be an island in constant movement. Mykonos, as a signifier of a new form of ontological nomadism, semiotically shares such assumptions. The Nomads of Mykonos keep returning to a series of alternative affective groups largely in order to heal a split: between their desire for autonomy, rebellion and aloneness and their need to affectively belong to a collectivity. Mykonos for the Mykoniots d’élection is their permanent ‘stopover’; their regular comings and goings discursively project onto Mykonos’ space an allegorical (discordant) notion of ‘home’. Pola Bousiou was born and educated in Thessaloniki, Greece, and later at the London School of Economics where she received her PhD in social anthropology. Subsequently she has turned to film-making; in her current research she is exploring the relationship between anthropology and film by deconstructing her auto-ethnographic text into an experimental film narrative.